Please scan your completed application to paulette@abcnhvt.org. You will receive an email back confirming that we have received your entry form. Recognizes commendable safety performance of individual firms. The awards are intended to convey ABC’s strong support of safety performance in full recognition of the fact that each firm has the responsibility for execution of safety, to ensure an overall safe workplace. The statistical data performance application will compile the statistical data that will provide the quantitative measure of the applicant’s safety performance. The statistical performance shall be compiled from data over three consecutive years in the past (previous year, plus two immediately prior years), and will key on injury/illness data. Injury/illness data will be for U.S.A. operations, comprising all personnel, including site-assigned personnel and headquarters and regional office personnel. The basic data requested by this program is already generated by the Injury/Illness Recording and Reporting systems mandated by the Occupational Safety and Health Act, Section 8 (c)(2) and 24 (a) and documented in OSHA Form No. 300, The U.S. Bureau of Labor Statistics Log and Summary of Occupational Injuries and Illnesses, for all companies operating in the United States. These regulations require all employers to maintain records of all work-related fatalities, injuries / illnesses which involve medical treatment, loss of consciousness, restriction of work or motion, or transfer to another job, with the exception of routine first aid. The award program is open to dues-paid members only of the New Hampshire/Vermont Chapter of Associated Builders & Contractors, Inc. The awards panel reserves the right not to consider a submittal if it deviates substantially from the national average incident rates. Associated Builders & Contractors’ Awards Panel will review applications that are complete, signed, and meet eligibility requirements. The evaluation will be based on a consensus decision by the panel taking into consideration the specific factors enumerated. The selections of the awards panel are irrevocable; their decisions are final. 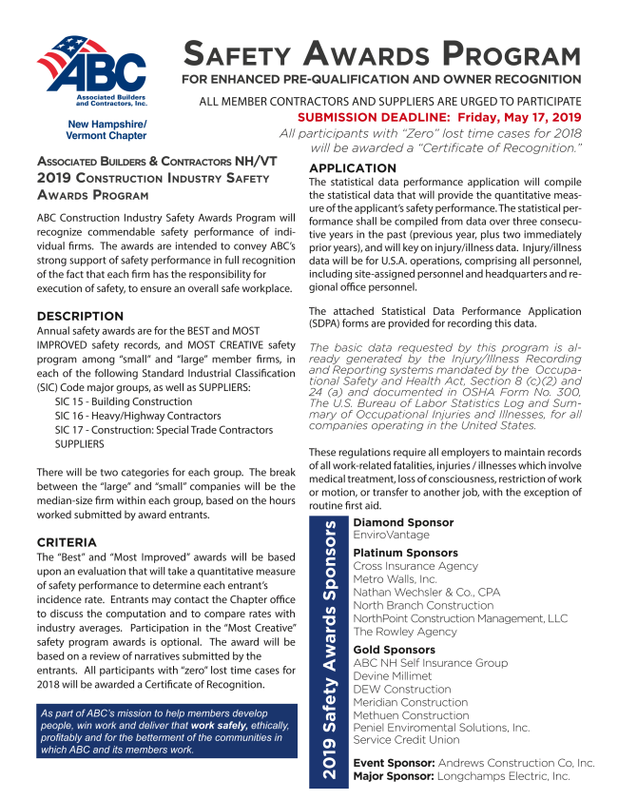 The recipients of the Construction Industry Safety Awards will be announced at the annual awards ceremony, and award recipients will be presented plaques and certificates to display their designation. The contest award recipients will also receive recognition through press releases and other public awareness campaigns.